As you get into electronic fabrication and repair, one of the first things you realize is how hard it can be to hold a PCB still while you work on it. Securing them is difficult due to their very nature: they’re often weird shapes, quite fragile, and of course need to be electrically isolated. If you don’t mind spending the money, and have the time to wait on it getting delivered, you can order some nice purpose-built systems for holding PCBs online. But what if you need something fast and cheap? [Paul Bryson] might have the solution for you. On his blog he’s documented how a trip to the dollar store and some parts from the junk bin allowed him to create a practical system for holding multiple PCBs of various shapes and sizes. The most exotic element of the build here are the hexagonal standoffs; and if you haven’t already salvaged a bunch of those from a curbside computer, he even gives the Mouser link where you can buy them new for a few cents each. Each individual stanchion of the system is made up of a 3/4″ round magnet with a hex standoff glued to the top. Over the standoff, [Paul] slipped a rubber grommet which gives a nice non-conductive slot to put the edge of the PCB in. Otherwise, a second hex standoff screwed into the first can be used to clamp down on the board. Adjusting the height is as simple as adding a couple more magnets to the stack. Of course, magnets need something metal to stick on. For that, [Paul] purchased some steel pie pans and matching rack from the dollar store. The round pans are easy to handle and give him plenty of surface area, and the rack makes for an exceptionally convenient storage unit for all the components. The conductivity of the pans might be a concern, but nothing the application of a rubberized spray coating couldn’t fix. We’ve covered similar systems before, but this one certainly looks to take the top spot in terms of economics. The only thing that would be cheaper would be a few feet of PLA filament and a rubber band. [Proto G] recently wrote in to share a very slick way of keeping tabs on all the tiny PCBs and devices that litter the modern electronics workbench. Rather than a big bulky PCB vise for each little board, he shows how to make tiny grippers with magnetic bases for only a couple bucks each. Combined with a sheet metal plate under an ESD mat, it allows him to securely position multiple PCBs all over his workspace. The key to this hack is the little standoffs that are usually used to mount signs to walls. These already have a clamping action by virtue of their design, but the “grip” of each standoff is improved with the addition of a triangular piece of plastic and rubber o-ring. With the gripping side of the equation sorted, small disc magnets are glued to the bottom of each standoff. 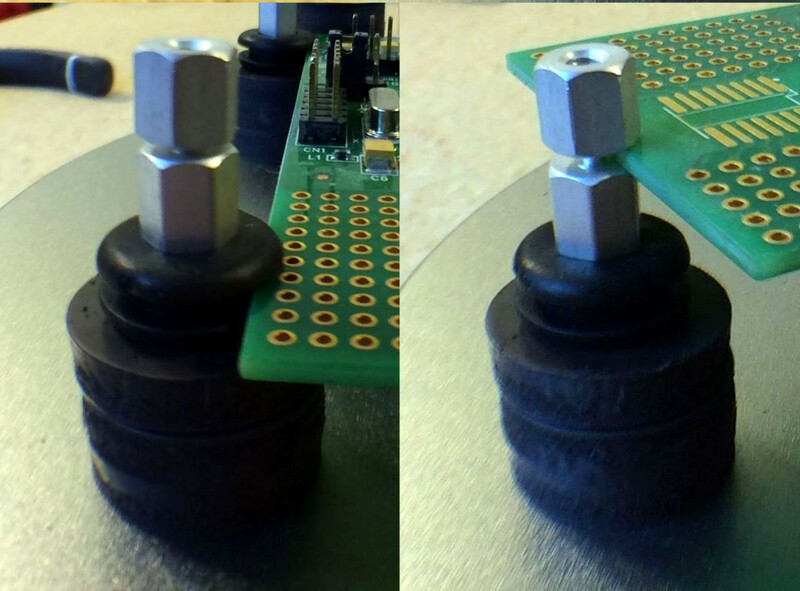 With a suitable surface, the magnets are strong enough to stay upright even with a decently large PCB in the jaws. An especially nice feature of using multiple small vises like this is that larger PCBs can be supported from a number of arbitrary points. 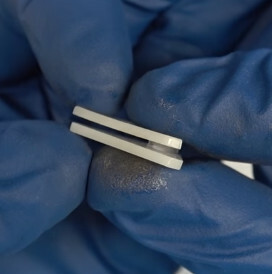 It can be difficult to clamp unusually shaped or component-laden PCBs in traditional vises, and the ability to place them wherever you like looks like it would be a huge help. We’ve recently covered some DIY 3D printed solutions for keeping little PCBs where you want them, but we have to say that this solution looks very compelling if you do a lot of work on small boards. If you’ve ever worked on a small PCB, you know how much of a hassle it can be to hold on to the thing. It’s almost as if they weren’t designed to be held in the grubby mitts of a human. As designs have become miniaturized over time, PCBs are often so fragile and festooned with components that tossing them into the alligator clips of the classic soldering “third hand” can damage them. The proper tool for this job is a dedicated PCB vise, which is like a normal bench vise except it doesn’t crank down very hard and usually has plastic pads on the jaws to protect the board. Only problem with a PCB vise is, like many cool tools and gadgets out there, not everybody owns one. Unless you’re doing regular PCB fabrication, you might not take the plunge and buy one either. So what’s a hacker on a budget to do when they’ve got fiddly little PCBs that need attention? Luckily for us, we live in a world where you can press a button and have a magical robot on your desktop build things for you. Online model repositories like Thingiverse and YouMagine are full of designs for printable PCB vises, all you have to do is pick one. After looking through a number of them I eventually decided on a model designed by [Delph27] on Thingiverse, which I think has a couple of compelling features and more than deserves the few meters of filament it will take to add to your bench. Of course the best part of all of this is that you can customize and improve the designs you download, which is what I’m about to do with this PCB vise!